Steam Marines 2 has its first Linux alpha build. 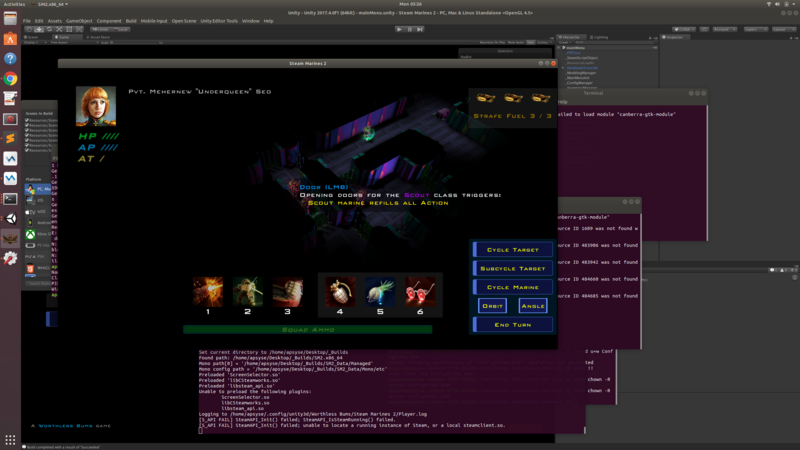 While Linux is still unofficially supported (I do not recommend purchasing the game if your sole intent is to play it on Linux), the goal is to get it tested on enough hardware/software profiles to know if there are any deal breaking bugs and to stomp them out. The minimum operating system required should be Ubuntu 14.04 based on Unity3D's 2017.3 changelog. My personal testing machine is a Lenovo Legion Y720 dual booting Windows 10 and Ubuntu 18.04 LTS; performance is very good. I have not tested on other Linux flavors, although I have an older laptop I intend to convert into separate Linux testing machine. Seeing as how Steam Marines 2 will eventually be on Steam, SteamOS will eventually be officially supported along with Ubuntu. Where the Linux build had problems relative to its Win/Mac counterparts: screen resolutions/mods and a very annoying double input bug. Also, due to the nature of the shaders being used the Steam Marines 2 Linux build will not run correctly with integrated Intel graphics cards. Please use integers for width and height, 1 or 0 for fullscreen. Also getres will report the current resolution to confirm any changes. The double input bug is an issue with Unity engines 2017.3.x up through 2018.1 (they say it's fixed in 2018.1, it as not been fixed in Ubuntu, and Steam Marines 2 will not be updating to version 2018.x of Unity regardless). Entering almost any keyboard input into input fields (such as the developer console, or renaming marines) inputs double. This has not been 100% correctly resolved: typing characters should input correctly, but left/right arrow keys to move caret position and deleting characters is not functioning correctly. If, for some reason, you are on a non-Ubuntu, Linux system and you cannot seem to type anything into input fields please report that! This would indicate that the double input patch I implemented needs to be applied more granularly (currently just applied on any Linux family operating system).